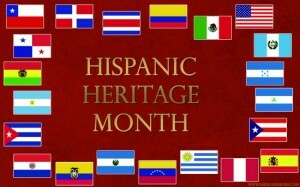 Every year, Americans observe National Hispanic Heritage Month from September 15 to October 15, by celebrating the history, culture, and contributions of American citizens whose ancestors originated from Spain, Mexico, the Caribbean, and Central and South America. September 15 is significant because it is the anniversary of independence for Latin American countries, Costa Rica, El Salvador, Guatemala, Honduras, and Nicaragua. In addition, Mexico and Chile celebrate their independence days on September 16 and September 18, and towards the end of Hispanic Heritage Month, Columbus Day or Día de la Raza is honored on October 12. KEEP YOUR EYE ON THE CULTURAL EVENTS BOARD FOR RELATED EVENTS!